Croixleur is one of those games that has a title that you will have no idea on how to pronounce it. However, don’t let the unpronounceable name dissuade you from taking a look at this game, for it is quite the entertaining deal. The game is an action game to it’s core and it takes that action right up into the end. How did we feel about Croixleur? Read on to find out more. The story in Croixleur is very, very basic. There are only a very small amount of characters in the game and they only really share a very few scenes within the title. In fact, I can summarise the story in about a sentence. The story is this: A red-haired protagonist must reach the top of a tower in less than 15 minutes and must also reach the top before her rival reaches the top of the tower first. What’s cool is that the storyline segments in the game can be dynamic as to your progress within the game. For example, I think it’s about three red coloured combat rooms, called Ring of Nirvana, up that you encounter the first of these. If you take longer than I think it’s eight minutes, you miss out on a scene with your rival, whereas if you’re faster than that, you get to team up with her. I like how the story changes like this based on how well you’re doing. Overall the story in Croixleur is incredibly basic. However, given the kind of game this is, I feel that the story does its job well and as such is beneficial to the title. 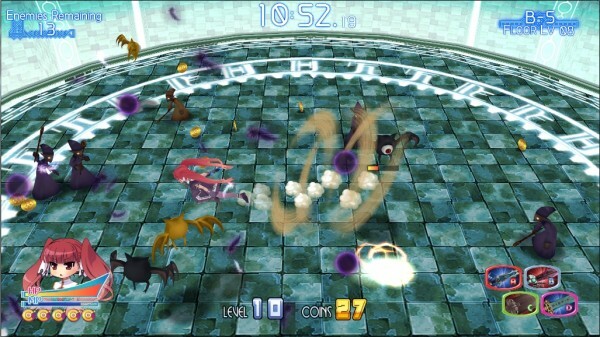 Croixleur is an action game and you can tell it’s an action game from the get go. There is no deep or complex storyline, all the characters are cocky and the basic level design all reflect the kind of game that this is. It is most certainly fun, but if you’re looking for something deep this game may not be reflective of your preferences. The main objective of this game is to reach the top of a 15 floor tower before the timer runs out. The timer counts down from 15 minutes the moment you take a step into the first room of the game. When it reaches zero, you lose. Each room is a circular shaped room where the player must kill all the enemies that spawn within the room in order to advance into the next circular shaped room. What gets tricky is that often you will be presented with multiple choices of room teleports. I’m not too sure how these work fully, but from what it looks like, some of these will advance you up the tower much more quickly than others. While advancing, you’ll notice that enemies change in colour, this makes them harder to kill, meaning that it takes longer later to advance and reach the top. Time management early on is vital to this game. When you die is Croixleur, it’s game over. You can only die once then you must start again. However, starting again is beneficial in this game as it allows you to reassess your abilities and change your loadout. As you progress you will unlock additional abilities and uncover the destination of teleports. When you die, this information gets saved, making your next playthrough just a little but easier. 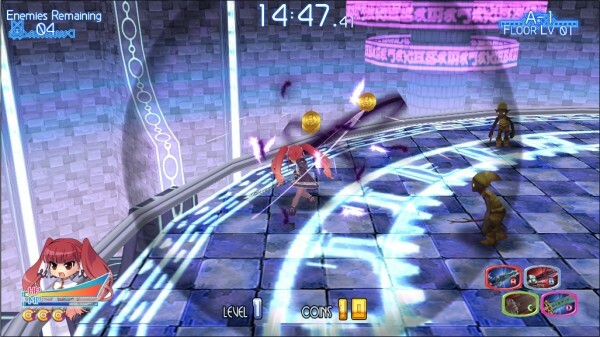 The gameplay in Croixleur is a lot of fun and definitely something that I’ve enjoyed playing. I’ll be coming back to this again later for sure. Visually speaking, Croixleur is a bit simple by todays standards, especially when it comes to a western audience. The character and enemy models are quite basic in shape and skins. Often you’ll find that stronger enemies are just repaints of older and weaker enemies. That isn’t to say that there is a lack of variety in the game when it comes to enemies, there are actually quite a few of them to fight. It’s just something that should be pointed out. I also really quite enjoyed the Anime-ish art style with the game, as an Otaku myself, I find the art style pleasing. 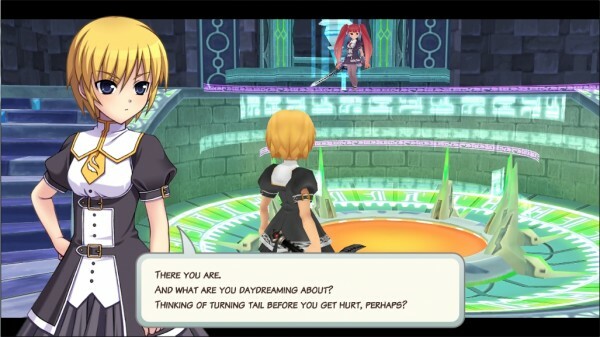 This look is carried across character stills in dialogue, artwork used in the very few cutscenes and even into the character models themselves. Croixleur has an Anime aesthetic and it suits the game quite well. 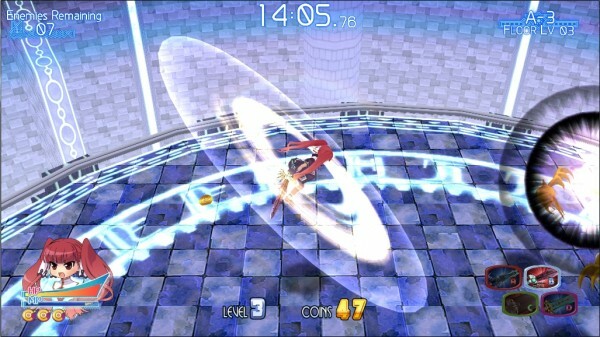 Croixleur has a very classic feel to its soundtrack. I want to say that it reminds me of classic gaming consoles like the Sega Megadrive, but it isn’t so much as in sound as it is in feel. The background score is constructed simply, but it really helps to pull you into the breadth of the scenario. If it wasn’t for the music, I don’t think this game would be even half as fun as it is currently. In fact, the fact that the soundtrack fits so well is I think the reason this game works as well as it does. It’s not a brilliant masterpiece soundtrack to be sure, it isn;t something you’d listen to while not playing the game, but the way it ties the components together is what makes it good. Unfortunately there is no voice acting in the game. As a doujin game, I wouldn’t have expected there to be either. However, many gamers are from circa 2006 and won’t know what to do with themselves should a game not appear to be fully voiced. 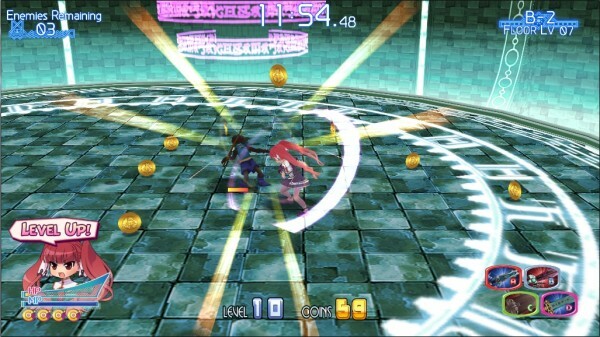 Croixleur is an incredibly fun game to play. It has tight and fun gameplay mechanics, a soundtrack that fits the game incredibly well and an art style that I found pleasing. While it isn’t the greatest game of all time, it is what it is meant to be: a lot of fun to play.